"The definitive V8 Supercars game is BACK!!" 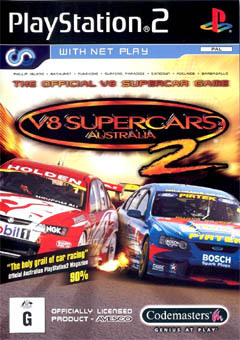 V8 Supercars Australia was easily the most popular car game of 2002 and pleased just about every Ford and Holden fan in Australia. Although V8 Supercars Australia 2 has been out for some time (on the XBox) because of a limited time exclusive, it's finally time for PlayStation 2 owners to experience one of the most thrilling and adrenaline pumping car experiences of 2004! Although the original game was extremely impressive on the PS2, it did suffer from a variety of graphical flaws and a few in game bugs that only annoyed the most avid car gamer. Fortunately, the developers have addressed these issues and the current incarnation of V8 Supercars is nothing short of spectacular. The only downside to this current incarnation is that the game only features the 2003 circuit of this popular motor sport. Although, it's a small price to pay for such a well designed and extremely entertaining V8 supercar game. 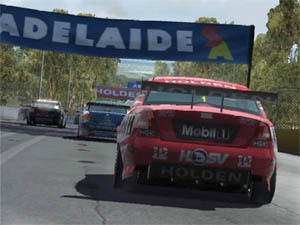 Once again, this game is the only official V8 Supercars game on the market and features all the popular Holden and Ford racing teams that include the Holden Racing Team and Ford Performance Racing team to name a few of the greats that grace this title. 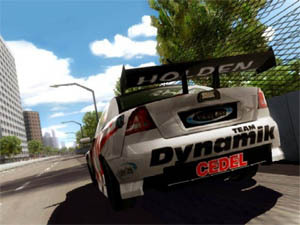 The game also contains a variety of accurate and official tracks that allows gamers to race in a variety of locations that include the beautiful Surfers Paradise or the outback Hidden Valley. V8 Supercars also boasts a career mode that follows the storyline of Ryan McKane who must drive his way through the world of touring cars. By playing the career mode, you also unlock a variety of tracks and also different gaming options. There is also a variety of championship categories that includes everything from our beloved V8 Supercars to the German DTM championship. The control system of V8 Supercars is similar to most car games on the market but I do plead caution to newbies because it will take some time getting use to the accurate control system. The DualShock controller works perfectly with this title and you can feel all the bumps and bruises of racing but for those racing fans that love realism, I would highly recommend a steering wheel for your console because that is what makes this game like you are almost there. Each car also handles differently that does help with the playability of the title because it does increase the longevity of gameplay. It should also be mentioned that the AI of the title is quite impressive and it's almost like you are playing against a real human player. Graphically, V8 Supercars is an amazing game and one could be forgiven in thinking that you are actually watching a real television broadcast with photo-realistic graphics, amazingly realistic car models with all the official advertising and some of the most impressive gaming environments that actually look like the intended destinations. So when you race in Sandown, you are actually racing the same circuit with all the curves, obstacles and backgrounds. The developers have also included a rather realistic physics engine that also effects how you play the game, so when you damage your car, the car reacts accordingly. I must admit that although the game does support some two-dimensional trees, it looks almost three-dimensional and for this reviewer, V8 Supercars Australia 2 has come a long way from its predecessor. 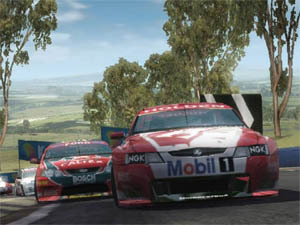 V8 Supercars also features all the sounds of V8 Racing and touring cars and whether you are bumping into another car, sliding on the kitty litter or racing at speeds over 200 kilometres an hour, the sound effects of this game have all been flawlessly implemented into this entertaining title. The voice acting of the title has also been professionally done and match that with a great musical score for the menu system and you have a game made in V8 gaming heaven. In conclusion, I would recommend V8 Supercars Australia 2 to any racing fan, especially those who love the V8 Supercars because this is as close one can get without actually being in the car. With amazing graphics, an awesome gaming engine and a perfect control system, this game is the Shangrila of car games, so stop reading and go out and buy this game now! Vrooooooom!!! P.S. this game also supports an insane network play option that lets you show your prowess against other V8 Supercars racers from around Australia and the world.